Freeport, Grand Bahama - Ross University Bahamas congratulates Meg Osman, Director of Student Services, Bahamas on becoming a recipient of the prestigious PRIDE Award. 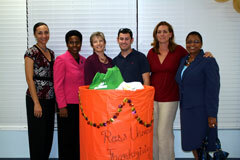 Freeport, Grand Bahama Island - Ross University celebrated the one year anniversary of their Bahamas clinical site recently. The site opened for its first day of school on January 12th, 2009. The staff and faculty held a celebration dinner in December at Seahorse Plaza and remarks were made by the Dean of the Ross University School of Medicine, Dr. Mary Coleman. Mrs. Anne Bergen-Taylor Ross University's internal consultant/regional director, DeVry University handed out the certificates and gifts to staff and faculty who had been there at least one full year, and the evening ended with cake and a Power Point presentation of photographs highlighting their past year. 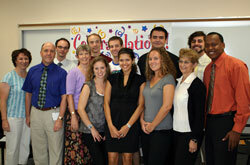 Freeport, Grand Bahama Island - On November 13th, 2009 the third Dean's List for students of the Ross University Medical School, Bahamas campus were acknowledged in an award ceremony with the Dean of the School of Medicine, Dr. Mary Coleman. The Ross University Dean's List is for students who receive all A's in their courses for two consecutive semesters and they remain on the Dean's List as long as they maintain a B average in subsequent semesters. The Dean’s List is posted every semester as soon as grades are available from the previous semester. 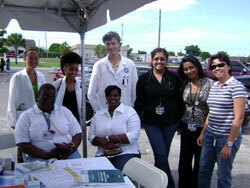 Freeport, Bahamas - Ross University held a clinic on November 7th, 2009 for a Diabets Screening at the downtown City Market parking lot. Students helped with Diabetes and Health Education, Blood Sugar testing, Blood Pressure Measurements, and BMI measurements. 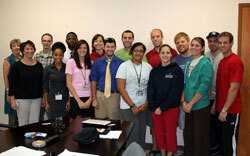 Ross students shown here standing are Lindsey Haga, Chandia Hanna, John Dollerschell, Aisha Wafa, and Neeti Patel. Ross University School of Medicine was recognized by the Florida Campus Compact and First Lady Michelle Obama for its commitment to public service and civic leadership. North Brunswick, NJ (PRWEB) - Ross University School of Medicine was among several healthcare institutions recognized at a gala luncheon hosted by the Florida Campus Compact and First Lady Michelle Obama honoring students and teachers from across the state of Florida for their commitment to public service and civic leadership on October 15th. Freeport, Grand Bahama, Bahamas - On Saturday, October 24th nine Ross University Bahamas students participated in giving free health screenings at the Marco City Urban Renewal Centre in Freeport. The event was organized by Mrs. Myrtle Cartwright, the Centre manager. Nurses from the Rand Memorial Hospital also participated, those being Kathy Saunder, Debra Smith and coordinator, Yvonne Clarke. Dr. George Charite, President of the Association explains about this year's conference, "Our theme this year is, “Building New Bridges,” to highlight the need to build richer networks with all stakeholders and patrons, such as Insurance Companies, Faith-based Organizations, Governmental, Non-governmental Organizations, Agencies and our communities. 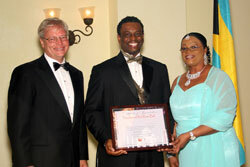 We are delighted that Ross University has partnered with us this year to share various modalities of management of diseases and Build New Bridges..."
Freeport, Grand Bahama Island - On July 31st Mrs. Mary Cooper, Executive Assistant to the Executive Administrator and Dean received the Ron Taylor Award from Ross University. Dr. Mary Coleman, Dean, Ross School of Medicine was on hand to present Mrs. Cooper with her award and bonus remuneration in front of fellow employees and faculty of Ross University at the Freeport campus. 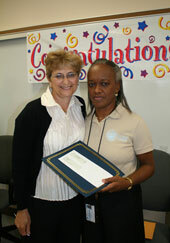 Mrs. Cooper is the first employee from the Bahamas campus to receive this esteemed award. 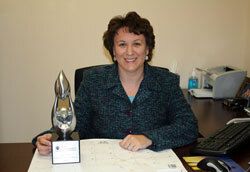 The Ron Taylor Award, named after a chief executive officer of DeVry Inc, is an annual award that goes to DeVry or Ross University employees who have gone above and beyond their normal job function while still completing all required duties of their position. The award goes to those who have truly exceeded performance expectations for the year. ..
Freeport, Grand Bahama Island - Ross University Bahamas will play host to approximately 200 students from their Dominica campus Thursday, July 16th to Sunday, July 19th. 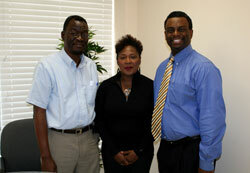 Students from Ross University in Dominica who are considering schooling in The Bahamas have been invited to experience Grand Bahama first-hand and will have the opportunity to receive an in-depth orientation of academic life, have a tour of the campus and learn about the island; all the while being hosted by students and faculty from The Bahamas. They will also visit the Rand Hospital and preview housing options. Half of the students arrived by charter plane on Thursday, and a second group by charter on Friday. Grand Bahama Island - Ross University Professor, Dr. Desiree Cox is to give Grand Rounds at the New Jersey Neuroscience Institute, JFK Medical Center on Wednesday, April 29th.